This Google Map the site where the massive groundscraper is being built. Kings Cross station, which is on the right of the map, has extensive connections to the North-East of England and Scotland. St. Pancras station, which is on the left of the map, has extensive connections to the Midlands and Belgium, France and the Netherlands, with more services to come including Germany, Switzerland and Western France. Thameslink runs North-South beneath St. Pancras station, has extensive connections to Bedfordshire, Herfordshire, Kent, Surrey and Sussex. There are also six Underground Lines. Gatwick and Luton Airports have direct connections and City, Heathrow and Southend Airports only need a step-free change. Improvements in the next few years could mean that HS2 and all of London’s five airports will have a fast direct connection to the area. 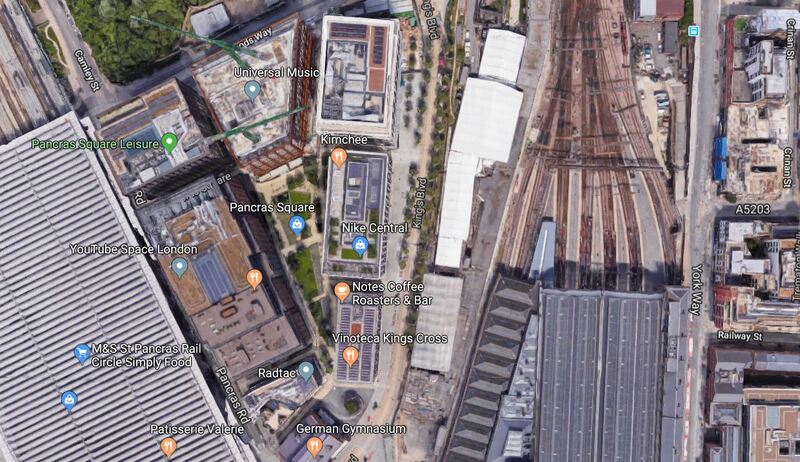 In the middle of all these railway lines, sits Google’s groundscraper, which shows as a white structure towards the top of the map. These pictures show the area between the two stations, the under-construction groundscraper and the new blocks. And these pictures show the progress on the site. There is not much that is visible yet! But the building will be more visible soon! For those who can’t wait, this article from the Daily Mail has a lot of visualisations. Thank you very much for having reached my request, to show me at what stage the construction of the Google HQ building will go.